For the first time since the war in Iraq began, U.S. troops faced fierce resistance and took heavy casualties on Sunday – and meanwhile, Americans back home came to think they might be in for a long fight. Yet it is a fight they continue to support. A growing number of Americans now believe that Iraq was indeed a threat to the United States that required this military action; in fact, increasing numbers think the U.S. needs to use even more force than it is now. Americans now see Iraq as more of a threat than they did before the war: 61% of Americans now say Iraq was a threat that required the U.S. to take action now. Before hostilities began, Americans were more closely split on that question: half said it was a threat that required military action, but 41 percent said it could be contained and another 5 percent said it was not a threat at all. RE-ASSESSING THE THREAT: IRAQ WAS … ? In the first days of battle, as coalition forces made rapid progress into Iraq, Americans expected a war of weeks. On Sunday, opinion changed, and a majority now says it will go on fore many months. Given the choice, most Americans still say the war will be quick and successful, not long and costly. But in the first days of battle, 62 percent of Americans said the war would be over quickly. On Sunday, that figure dropped to 53 percent. Faced with a possibly lengthening war, one in three Americans would take even stronger action against Iraq than the U.S. military is right now. Though a majority says the U.S. is using the right amount of force in Iraq, there was a jump among those interviewed on Sunday in the share that thought the U.S. should be using even more force. This sentiment is particularly strong among men: 40 percent of men now think the U.S. should use more force, while 27 percent of women do. 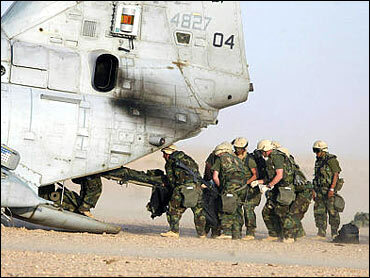 However, Americans appear to foresee troops getting more bogged down than coming into harm. Most still believe the U.S. will take less than 1,000 casualties, unchanged from the days before. While they are starting to wonder about the length of the war, Americans overwhelmingly believe it is going well. 88 percent say it is. Americans still overwhelmingly approve of U.S. involvement in Iraq and the goal of removing Saddam Hussein from power – and that sentiment appears to have increased a bit on Sunday. 80 percent of those interviewed on Sunday said they approved of U.S. military action to remove Saddam Hussein from power there. Approval of action had remained stable at 76 percent for the first three days of fighting. Americans also retain their belief that removing Saddam Hussein from power is worth the costs of the war – both the financial costs and the possible loss of life. Two out of three Americans continue to say that. More than two-thirds, 69 percent, also say they are proud of what the U.S. is doing in Iraq. Americans may have been paying more attention to news about the war on Sunday – or at least said their daily lives had been affected by the coverage. A majority of those interviewed on Sunday said they were staying up later or getting up earlier to follow the news about the war, something that was not the case on Saturday. CHANGING SLEEP HABITS TO FOLLOW NEWS ABOUT WAR? As the battle rages in Iraq, Americans are rallying around President George W. Bush; his approval ratings continue to rise. This is even the case for the non-military aspect of his job, handling of the economy. For the first time since July, a majority of Americans approve of the way George W. Bush is handling the economy. Three-quarters approve of his handling of the situation with Iraq. This poll was conducted among a nationwide random sample of 605 adults interviewed on March 23, 2003. The error due to sampling for results based on the entire sample could be plus or minus four percentage points. Some questions (where indicated) are based on several days of interviewing. The full set of interviews was conducted among 1,956 adults from March 20-23; the sampling error is plus or minus two percentage points.